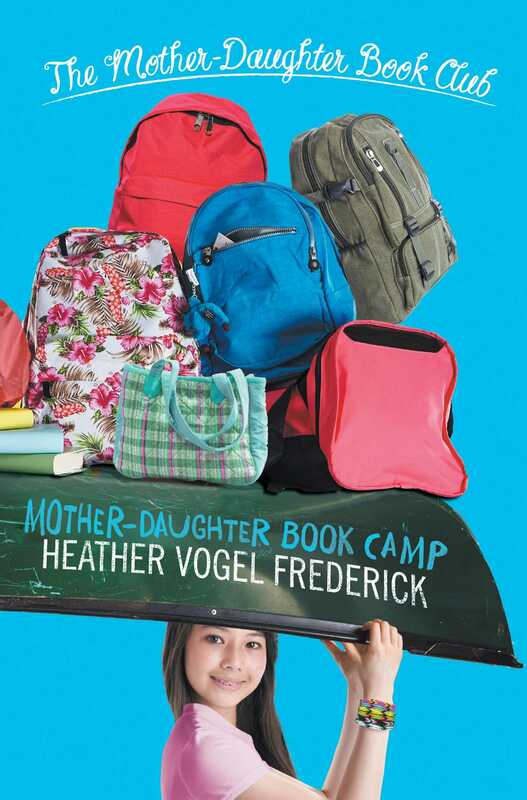 Spend one last summer with the Mother-Daughter Book Club at camp in this bittersweet conclusion to Heather Vogel Frederick’s beloved and bestselling series. After so many summers together, Emma, Jess, Megan, Becca, and Cassidy are reunited for one final hurrah before they go their separate ways. The plan is to spend their summer as counselors at Camp Lovejoy in a scenic, remote corner of New Hampshire, but things get off to a rocky start when their young charges are stricken with a severe case of homesickness. Hopefully, a little bit of bibliotherapy will do the trick, as the girls bring their longstanding book club to camp. “I can’t believe I gave up my internship for this,” moans Megan, staring glumly out the rain-streaked window. Cassidy turns the windshield wipers on the minivan to the highest setting. “Whose idea was it, anyway?” she asks, scowling at the road ahead. My friends have been needling Jess ever since we left Concord. Not that I blame them—I haven’t seen this much rain since that soggy year I lived in England. It drizzled all week back at home, but Mother Nature really turned on the faucets when we crossed the border from Massachusetts into New Hampshire a couple of hours ago. “Things won’t seem so bad once it clears up,” says Becca, who is calmly filing her nails. I give her a sidelong glance. Becca’s not usually this cheerful. I’m guessing her good mood is the result of the care package she got from Theo Rochester, her long-distance crush. He sent it care of Pies & Prejudice, Megan’s grandmother’s tea shop, where Becca has been working part-time after school. It’s kind of our hangout—and by “our” I mean the mother-daughter book club that we started back in middle school and that’s been going strong ever since. We all happened to be at the tea shop when the package arrived yesterday afternoon. “Box of snakes?” Cassidy had asked, smirking. Snakes are Theo Rochester’s passion in life. Becca had refused to take the bait. She’d just laughed and opened the box eagerly, pulling out a University of Minnesota T-shirt—the one she’s now proudly wearing—some fudge, and a small stuffed gopher with an M on the front. Goldy Gopher is the university’s mascot, as Becca has told us about a zillion times since she got her acceptance letter. A gopher isn’t exactly the most inspiring mascot—it’s not like a tiger or a bear or something—but Becca is so ridiculously happy about the fact that she’s heading to Minneapolis for college this fall that no one wants to burst her bubble. “That’s because we are in the middle of nowhere,” Cassidy replies, scanning the road ahead from under her baseball cap—her favorite Red Sox one, of course. “Sheesh, Jess, way to give me a heart attack!” Cassidy slows, flipping on the blinker, and a moment later we turn off onto a gravel road marked CAMP LOVEJOY. She pulls into a parking area in front of a small log cabin. There’s a sign over the front door that says OFFICE, but no lights are on inside, and as far as I can tell, no people, either. We watch as she picks her way gingerly across the puddle-pocked gravel, knocks on the door, peers through the window, knocks again, then looks over at us and shrugs. “Nobody’s there,” she reports, climbing back in beside me again and shaking raindrops from the end of her long blond braid. “Shut up, Megan,” Jess snaps. Megan was offered an internship at Flash magazine this summer, and even though the editors assured her that it wasn’t her only chance, and that she could take them up on the offer any time she wanted, and even though she signed up of her own free will to be a counselor here along with the rest of us, she’s been lamenting her choice ever since we started our road trip this morning. The minivan lurches and swerves as Cassidy tries to avoid the potholes in the unpaved road. A moment later, we plunge into darkness. The sky is completely obscured by tall trees overhead. Tall, wet trees, their branches dripping nearly as much rain as the clouds above. I reach over and pat her knee. She’s my best friend in the whole world, and because I know her inside and out, I can tell she’s just about had it. The thing is, though, Megan’s got a point. It’s only 4:30 in the afternoon and it’s the middle of summer, but this road is as dark and gloomy as something out of one of Grimms’ fairy tales. I stare glumly out the window. This was supposed to be a fun adventure—what could be better than spending our last summer before college together, working as camp counselors?—but so far the adventure hasn’t been off to a good start. I’d been so looking forward to getting away from Concord. Too many memories in our hometown right now, and too much heartache. Stewart and I were done. He’d gone off to Middlebury College and gotten himself a shiny new girlfriend, and even though we’re technically still “friends,” it’s been really hard seeing him around town all the time these last few weeks. Which is pretty much inevitable, since he’s Becca’s brother and the Chadwick family and my family live on the same street. Plus, Stewart got a summer job at Vanderhof’s Hardware, just a few doors down from Pies & Prejudice, and we’d been crossing paths almost daily ever since he got home from Vermont. So when the opportunity came to get out of town and head to a camp in the New Hampshire woods, I’d jumped at the chance. Jess’s mom and aunt were the ones who suggested it. I guess they went here when they were kids, and Jess was a camper for a couple of summers too. Her aunt and uncle own an inn not too far from Lake Lovejoy, and when her aunt saw an ad in the local paper that said the camp was hiring, she told Mrs. Delaney and Mrs. Delaney told Jess. Technically, Camp Lovejoy prefers that their counselors spend a summer as CITs first—that’s short for “counselor-in-training”—but we were all too old for that program. Jess’s aunt Bridget is good friends with the camp director, though, and she vouched for us, so here we are. Cassidy swerves to avoid another pothole, and Jess and I bump shoulders. She glances over at me. “Everything’s going to be fine, I promise,” she whispers. She’s not just talking about the weather. Jess is my best friend in the whole world too, and she knows me inside and out. She knows how hard these past few months have been. “I hope so,” I whisper back. As we emerge from under the protective canopy of trees, water drums against the roof. The rain isn’t letting up a bit. If anything, it’s coming down harder. “There’s the Dining Hall,” Jess tells us, pointing through the water-streaked windshield to a large, rambling log building ahead. Lights gleam from the windows—that’s a promising sign—and there are a dozen or so cars in the parking area near the flagpole. “See?” she says triumphantly. “We aren’t the only ones here after all.” Then she shrieks, and the minivan swerves again. Sure enough, in the distance beyond the Dining Hall, shrouded in mist, I can just make out the expanse of gray that is Lake Lovejoy. Right now though, it doesn’t look the least bit inviting. Just big and cold and wet. Cassidy pulls into a parking spot and we all climb out, trying to avoid the mud puddles as we huddle together in our rain jackets, peering at what we’ll be calling home for the next seven weeks. My heart sinks. It’s not exactly the picture-perfect postcard setting I’d been expecting. A gust of wind sends the rope on the nearby flagpole slapping soggily against the metal pole and drives a rivulet of cold water under my hood and down my neck. I jump, letting out a yelp of displeasure. Jess turns around. Spotting the expression on my face, she shoots me a look that clearly says, Not you, too? “I’m fine,” I mutter, flinching as another gust rattles the big wooden WELCOME TO CAMP LOVEJOY! sign. I’m feeling anything but welcome right now. The door to the Dining Hall flies open, and someone emerges carrying a giant umbrella. “Jessica Delaney!” the someone cries, splashing over to join us. She enfolds Jess in a one-armed hug while raising the umbrella high in an attempt to shelter the rest of us. We crowd under it like chicks under the wings of a mother hen. Jess nods. Under the hood of the woman’s rain poncho I catch sight of close-cropped Afro-style hair flecked with gray. Beneath it, a pair of bright brown eyes regard me cheerfully. When the woman smiles, I can’t help smiling back. We follow her across the parking lot to the Dining Hall’s wide front porch. I make a mental note to revisit it on a sunny day, as the row of rocking chairs looks like a promising spot to sit and read. Inside, we hang up our rain jackets on wooden pegs in the coatroom, then continue into the main dining area. “If Camp Lovejoy has a beating heart, this is it,” Gwen tells us, raising her voice to be heard above the hubbub. The other counselors are clustered around a crackling fire in the big stone hearth at the far end of the room, talking and laughing. For a moment, I feel that familiar flutter of anxiety in my stomach that comes from being with a bunch of people I don’t know, but I tell myself to quit being an idiot. I’m not in middle school anymore. I’m heading to college in a few months, and the girls all look friendly enough. I give her a rueful smile. Sometimes it’s a pain to have a best friend who knows you so well. Jess loves to remind me about the day we met. It was the first day of school, and I was so nervous I threw up on our kindergarten teacher’s shoes. She heads to the kitchen, and my friends and I make a beeline for the hot drinks. As I take a sip of cocoa, I feel myself start to relax. Jess is right. Everything is going to be just fine. The rain will stop, the sun will come out, and we’ll all have an idyllic summer by the lake with a bunch of adorable girls to mother. The best part? Jess and I are going to be co-counselors. We’d been assigned to Nest, the cabin for the youngest girls at camp. Becca and Megan will be right next door in Balsam, with the eight-year-olds, and Cassidy gamely volunteered to share a cabin with a stranger. She’d been assigned to Twin Pines, along with a seasoned counselor named Amanda Dixon. They’ll be in charge of the nine-year-olds. This announcement prompts a hearty cheer. Now that all of you are here! Cassidy elbows me in the ribs. “Stanley would totally love this place,” she murmurs, and I have to stifle a laugh. Her stepfather has a cornball sense of humor. We all love him for it, though. I’m not much for being the center of attention, but I muster a smile and wave gamely when Gwen announces my name. The other counselors smile and wave back, and I feel the flutters in my stomach subside. Then Gwen drops a bombshell. The fireplace crowd groans loudly. Amanda is clearly a favorite. I look over at Cassidy to see how she’s taking the news about her co-counselor, but it doesn’t seem to faze her. Panic washes over me. We’re not going to be together? And then the bombshell explodes. “I’ll be assigning Felicia to take Jess’s place in Nest,” Gwen continues. The crowd by the fireplace parts. A girl steps forward and I stare at her blankly for a moment. There’s something familiar about those blond braids coiled around her ears like a pair of cinnamon rolls. For a moment I can’t put my finger on it. The Felicia that Gwen is talking about is Felicia Grunewald! Jess’s know-it-all cousin! “You didn’t tell me she was going to be here!” I whisper frantically to Jess. I look over at Gwen, hoping beyond hope that she was kidding. She had to be—Felicia nearly ruined my friendship with Jess the last time our paths crossed. I clutch Jess’s arm. This couldn’t be happening! Our summer was ruined. With Felicia as my co-counselor, camp wasn’t going to be any fun at all. It was going to be a disaster. 1. Have you read other books in this series or was this your first introduction to the characters? If you hadn’t met them before, were you interested in them? Were you curious enough to go back and read the earlier books? If you had met them before, is your favorite character the same as she was in previous books? 2. Have you read other books where more than one character narrated, in alternate chapters? Which ones? How was this book like those books? How was it different? Do you enjoy hearing more than one character’s voice in a single story? 3. Have you read Understood Betsy? If not, do you want to read it now? If so, discuss how that book’s events are reflected in this book’s events. Why do these girls enjoy such an old-fashioned book? Share some examples of old-fashioned books that you like. Can you suggest a few books that each of the girls might especially enjoy, and why? 4. Did you go to camp? How was your experience? How was it similar to, or different from, the Camp Lovejoy experience? Share some camp memories. 5. What would your ideal camp job be? Would you enjoy spending the summer with your friends, or would you enjoy going to camp alone and making new friends? Would you rather be counselors with your friends, or go alone to make new ones? 6. This is the final book in the Mother-Daughter Book Club series. Do you think the author has chosen a good place to end the series, or do you think there could be more? 7. This is the girls’ last summer together as they are on the brink of attending college. Do you think they will remain good friends, or will they grow apart? 8. Describe each girl with just one word. For example, for Megan you might say “fashion.” How are these words a clue to the girls’ futures? Which of their future careers can you identify with? Are you as focused on your future career as they seem to be? 9. Discuss how the opening setting of the book, with the girls’ dark and rainy arrival at camp, sets up their expectations of their summer experience. What happens to make them start thinking in a more positive way? How would a bright and sunny setting have started the book off differently? 10. Give an example of when one of the girls surprised you, like when Cassidy says, “a person could get kind of choked up . . . if a person were the type to get choked up. Which I’m not.” Do you enjoy being surprised by a character, or would you rather he or she stay predictable? 11. The camp motto is “Broadening horizons for over a century.” What does this motto mean, and how does it relate to the girls? Discuss how the motto is also one of the main themes of the book. 12. Do you have a favorite book that is, as Emma says, “as comfortable as my favorite pair of slippers”? Are there common types of themes, plots, or characters in your favorite books? 13. The book club members think that Jess’s cousin Felicia is O.D.D. (their code for “odd”). Do you agree? How is Felicia different, and how do the girls begin to appreciate her? Do you have friends like Felicia? 14. Discuss the character of Sergeant Marge and the stereotypes she represents. Why does the author include her? Does she seem inflexible just because she is an adult? Does the author succeed in showing her as a relatable person by the end of the book? 15. Do you think these books would make a good TV series? Why or why not? 16. The camp director tells the counselors to try and give the campers a “memory-maker” before the summer is over, to give them a chance to do something naughty with the thrill of getting caught. Do you think this idea of planned mischief works well? Does the fact that it’s been planned make it an artificial experience? 17. Emma says, “Why is it that talking to my mother always makes me feel so much better?” Is this true for you? How are you and your mother alike, and different? 18. Megan and Becca think that Emma is in “full reinvention mode” after her breakup with Stewart. Have you ever wanted to reinvent yourself? Why? How would you begin? 19. Camp Lovejoy is a tech-free zone, and no mirrors, makeup, or beauty products are allowed. Do you think this is a good thing? Are those items unnecessary distractions? Would you be able to enjoy your summer without them? 20. Emma’s mom tells her, “Happiness is about doing some good in this world . . . It comes from finding what you were meant to do, and doing it.” Do you agree? Discuss how this advice might be received and understood by each character by the end of the book. 1. Choose one of the following quotes from Understood Betsy and write a short essay relating the quote to the plot or characters in Mother-Daughter Book Camp. 2. In Chapter 4, Gwen, the camp director, introduces the camp philosophy, saying, “We accept no limitations at Camp Lovejoy.” Write your own pep talk welcoming campers and counselors, and then perform it for the others in your group. 3. Write a script for an episode of a TV show based on one of the book’s chapters, and stage a reading with the group. 5. As the girls do for Dorothy Canfield Fisher, the author of Understood Betsy, compile a list of Fun Facts about this book’s author, Heather Vogel Frederick. 6. If you are musically inclined, compose a new camp song for Camp Lovejoy. Then record and/or perform it for your group. 7. Imagine that you are a camper at Camp Lovejoy, and write a letter home to your best friend. Describe your cabin’s counselors, and describe what a good (or rotten!) time you’re having. Heather Vogel Frederick is the award-winning author of the Mother-Daughter Book Club series, Absolutely Truly, the Patience Goodspeed books, the Spy Mice series, and Once Upon a Toad. An avid fan of all things maple, Heather and her husband have recently been transplanted from Portland, Oregon, back to New England, close to where Heather grew up. 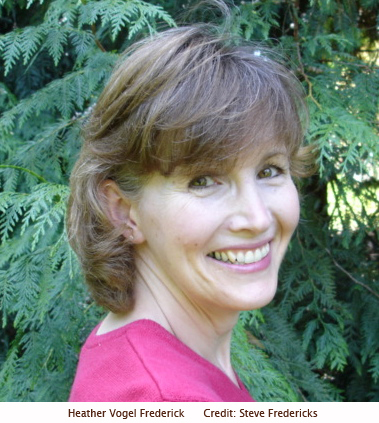 You can learn more about the author and her books at HeatherVogelFrederick.com. "Pranks, songs, poems, food, and games. . . . all innocent fun for summer campers."